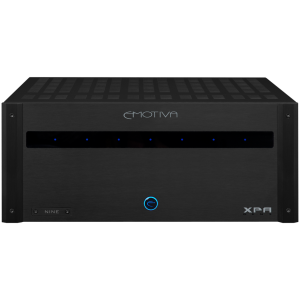 XPA-9 is a nine Channel home theatre power amplifier from the X range with high current SMPS technology, unique differential input stage and 3KW of continuous power. Earn 2349 loyalty points when you order this item. 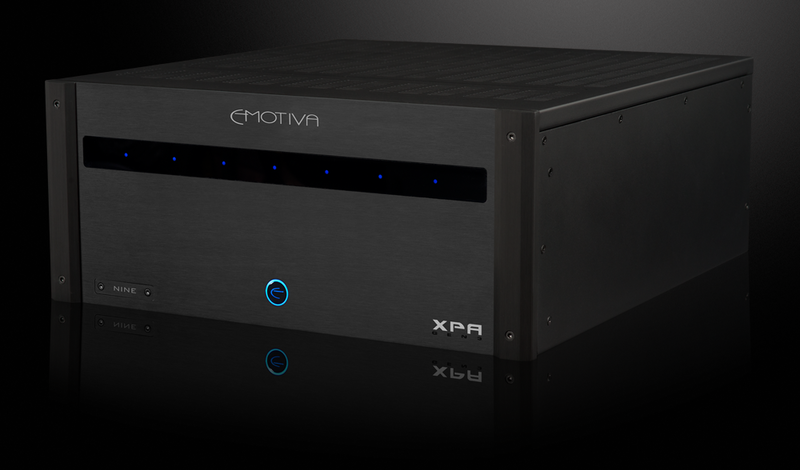 - Dimensions (WHD): 17" x 8" x 19"
Emotiva XPA-9 Gen3 is a nine-channel audiophile power amplifier that delivers exceptionally accurate and dynamic renditions of all types of music. It offers the rare combination of excellent technical performance and superb sound quality, which makes it the perfect solution for listening to your favourite multi-channel music or for listening to movie soundtracks in a high-end home theatre system. This fully modular audio power amplifier has a high-efficiency switch mode power supply (SMPS), independent, fully discrete, dual differential, high current, short signal path Class A/B amplifier modules, Optimised Class H power supply topology and microprocessor-controlled fault protection. With X Series line, Emotiva analyzed everything in every amplifier they ever made, from front to back, inside, and out. In doing so, they discovered several areas where years of experience and advances in audio technology, indicated significant improvements could be made in amplifier designs. After carefully weighing all the pros and cons, they kept the best features of original designs, added a new set of optimisations and improvements and the result became the foundation of a new line of audiophile amplifiers. The XPA Gen 3 is a whole new ballgame. In amplifier design, everything starts with the power supply. The XPA-9 Gen3 features new high-current switch mode power supply (SMPS) - a lightweight, powerful, intelligent design capable of delivering over 3 kW of continuous power with absolute reliability and extremely high efficiency. Our cutting-edge SMPS offers the dynamic attributes of a classic transformer-based design with none of the drawbacks. Like the best transformer-based power supplies, our SMPS delivers plenty of continuous power to enable our amplifier modules to live up to their full performance potential, and plenty of dynamic power to ensure that musical peaks will never be compressed or limited. However, compared to transformer-based designs, our SMPS is lighter and more efficient; it’s also fully regulated, which ensures optimum performance under a wider range of load conditions. The XPA-9 Gen3 is designed, assembled, and tested in the USA, where Emotiva use the finest materials and latest technologies to bring you world-class products. Each Emotiva amplifier is carefully engineered and designed with premium components to deliver a stunningly capable, reliable, and refined system. The XPA Gen3 modular power amplifier is comprised of a heavy-duty chassis, which houses the oversized power supply, and up to seven amplifier modules. The XPA Gen3 can be purchased with anywhere between two and seven amplifier modules installed, and additional amplifier modules may be installed as more channels of amplification are needed (up to a maximum of seven modules). The front panel display and protection system are designed to work with the maximum number of channels, and so need not be updated when the XPA Gen3 is expanded; on the rear panel, slots not occupied by amplifier modules will be covered with protective cover panels. All seven module slots in the XPA-9 Gen3 are already populated. The XPA-9 Gen3’s unique differential input stage, with cross-linked current sources, drives a balanced voltage amplification stage, and this advanced input circuitry delivers an incredibly accurate and pure audio signal to the complimentary, fully discrete output stage. Together they deliver a holistic, natural, and powerful listening experience. Low-level musical details and dialogue emerge from a deep black background; musical crescendos are delivered with both stunning impact and precision. The wide bandwidth, low distortion performance of the XPA-11 Gen3 reveals every nuance of your high-resolution music sources, and it has plenty of power to drive even difficult loudspeakers with absolute authority and control. Both amplifier modules used in the XPA-9 Gen3 utilise a fully analogue Class A/B output stage. The High-Powered Single Channel Modules feature highly regarded Soft-Switch Class H power supply topology, which increases their efficiency significantly without compromising the audio performance you’d expect from an Emotiva amplifier. They operate on a lower supply voltage at low power levels to minimise quiescent power consumption and standby power losses, instantly switching to a higher voltage rail when needed to ensure the signal passes cleanly and without clipping. This process happens on a continuous basis in real time, allowing greater overall efficiency, cooler operation, longer component life, reduced power consumption and increased reliability. The Stereo Modules each deliver two completely independent channels of pure Class A/B audio power and sonically are perfectly matched to the High-Powered Single Channel Modules. Most experts agree that, if you want the absolute best sound quality and technical performance, you should use dedicated separate components. Because these power amplifiers are designed for a single purpose, Emotiva can concentrate on ensuring that they perform that one task very well and avoid the compromises inherent in products that are expected to perform a variety of different functions. The amplifier modules are designed to reproduce today’s high definition movie soundtracks and music sources with awesome realism, amazing finesse and precision, and without the slightest hint of strain or signal compression. Specially designed 3kW switch mode power supply delivers the tightly regulated continuous power and massive reserves of dynamic power necessary to enable amplifier modules to perform to their ultimate potential. Together they deliver an experience that simply cannot be matched by multi-purpose components like receivers. 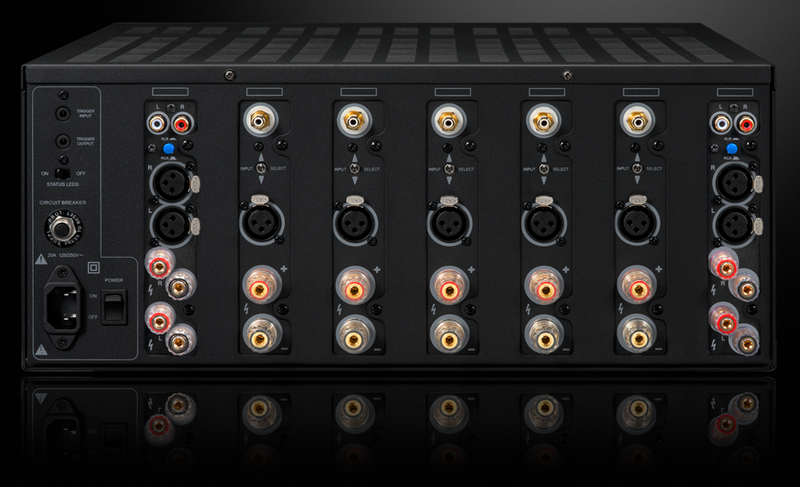 XPA-9 Gen3 features five High-Powered Single Channel Modules and two Stereo Modules for a total of five high-powered channels and four low-powered channels. This combination is ideal to power a surround sound system that includes five large speakers and four smaller height speakers – and is the perfect amplifier to power a Dolby Atmos 7.1.2 or 5.1.4 system. The XPA-9 Gen3 would also be a great choice for driving a 7.1 or 7.2 channel surround sound system that also includes a second pair of small speakers – perhaps ceiling speakers – in a second zone.